Barry Murphy is absolutely hilarious as either an After-Dinner speaker or event MC and regularly adopts the role of a guest foreign consultant, invited to discuss the organisation and potentially individuals in the room. Barry’ unique brand of comedy provides an alternative and comical slant on conference presentations. He buries himself in the company and re-emerges as a visiting consultant who incorporates slides of sales figures/targets, advertising campaigns, company outings or Christmas parties in his presentation. His approach ensures that delegates embrace the ideas outlined in the conference and enjoy an extremely humourous and uplifting presentation. Whether as one-third of Après Match, as his German alter ego Günther, or as his surreal and wonderful self, Barry is “one of the high kings of Irish comedy” (Hot Press) and is simply not to be missed. Barry Murphy is often remembered for the six years he spent as a member of the cult comedy trio, Mr Trellis, with Kevin Gildea and Ardal O Hanlon. He is the co-founder of the Comedy Cellar – Ireland’s longest running comedy venue, and is easily recognised as one of the “ten kings of Irish Comedy over the last 20 years” (Hot Press Magazine). An avid golfer, Barry is also a popular guest at corporate golf days and will entertain your guests with humour and style. Barry appears regularly on TV impersonating mainly famous soccer stars and pundits. 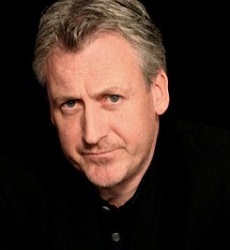 Barry is a hugely popular event MC and has successfully hosted many events including The Irish Film Awards, Amnesty “Best Of Irish” Showcases for Granada TV, the Irish Business Internet Awards, as well as numerous charity functions. Barry Murphy’s sheer originality and overwhelming talent guarantee that there is no other performer like him. To book Barry Murphy for your event or party or to talk to us about your event requirements, either submit the enquiry form, email us: info@carolandassociates.com or call us on 087 718 1360.